Joan Tapper (Morris) was born in 1920 near the village of Ysceifiog and her father Gwilym Morris was a farmer, engineer and local Magistrate. Mrs Tapper donated a number of other objects related to her family, including her father’s motorcycle goggles and Victorian box irons used by her mother. Iron overshot waterwheel, early 1900s. Iron overshot waterwheel, early 1900s. Donated by Mrs Tapper, it was her wish that is be restored to working order as it had been on her father’s farm in the 1920s. 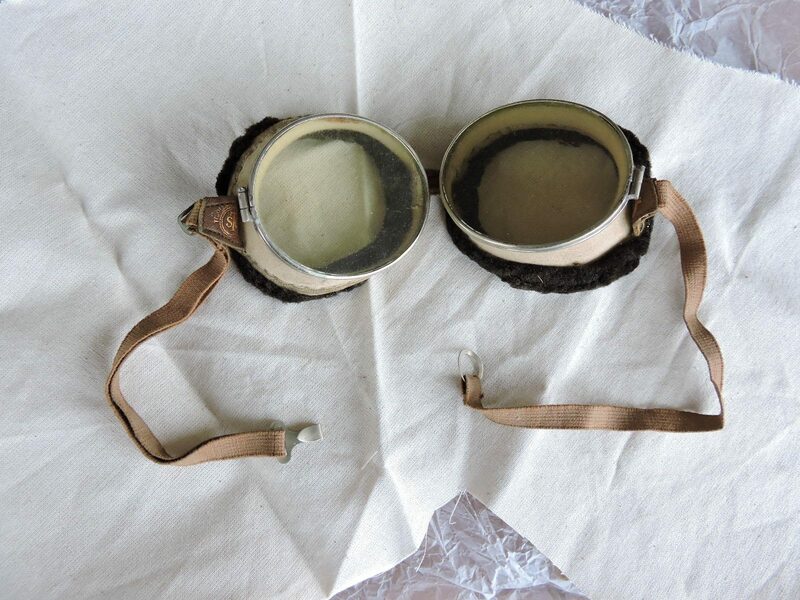 Motorcycle Goggles, 1920s. Used by Gwilym Morris for riding his motorcycle in the 1920s and 30s. Joan Tapper (Morris) was born in 1920 near the village of Ysceifiog and her father Gwilym Morris was a farmer, engineer and local Magistrate. By the time Joan was born, her father was making plans to build a mill pond on his farm near the village of Ysceifiog, in order to use an iron waterwheel he had acquired from two spinster sisters, to generate electricity. It was very rare for electricity to be available in rural areas in the 1920s so Gwilym was a real innovator. He used his technical and engineering knowledge to install the wheel on his farm and used it to power not only the lights and machinery on the farm but also the local chapel on Sundays. “We never had power cuts in our house!”, Mrs Tapper. 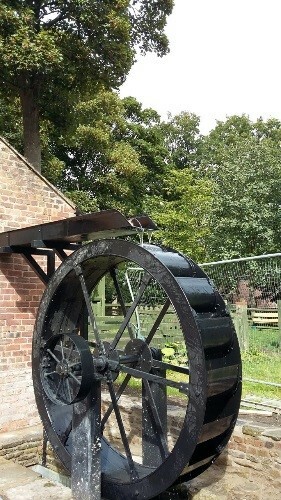 The waterwheel was used into the 1950s and by the 1980s Mrs Tapper had donated the wheel to Erddig and from there it was moved to a mill in Pentrfoelas. By 2011, plans were underway for the wheel to come to Greenfield Valley and for a conservation project to begin. A group of volunteers lead by the Museum Warden restored the wheel to working order which can be viewed at the museum. Mrs Tapper donated a number of other objects related to her family, including her father’s motorcycle goggles and Victorian box irons used by her mother.